Panic over causing financial loss ... Defence Minister goes wild... Too little, too late Investigations by the "Chronicle" newspaper has revealed that the usually professional Ghana Armed Forces (GAF) has been engulfed in a huge scandal which is fast damaging its international reputation and may lead to a legal tussle, which could be too expensive to fight if immediate steps are not taken to rectify the embarrassing scandal which is hurting international investor confidence in Ghana. The scandal which also revealed security lapses within the Ghana Armed Forces is in respect of the sale of four scrapped Airforce Skyvan aircrafts which were sold to Pink Aviation Services, a reputed European aviation company for $42,000 late last year. GAF put the sale of the scrap aircrafts on international public tender and selected Pink Aviation as the winner. The company was asked by the GAF to pay the purchase price into GAF's dollar account, which was done. GAF transferred ownership of the aircrafts to Pink Aviation who also proceeded to register the aircrafts in their name in Europe. The company and their engineers from Europe spent time in Ghana to repair the aircraft to a point where they could fly it for further refurbishment in Europe but they have been prevented by GAF from getting close to the aircrafts. GAF has also cancelled the contract, citing internal lapses within the GAF, national interest and national sovereignty as the basis for halting the transaction. The Ghana Armed Forces has available for sale on “as is where is” basis, the scraps of Skyvans and Dolphin L-29 Aircraft. The Scraps consist of unserviceable engines, frames and other parts”. The letter continued that the aircraft scraps were located at the Air Force Base-Accra and the Air Force Station in Takoradi and that the scraps were available for inspection within working hours of 0830 hours to 12hrs from 12 to 19 November 2003. The conditions attached to the tender were that the buyer of the aircraft scraps would be responsible for the cost of cutting in-situ and transporting the scraps from the Air Force Base/Station within two weeks after sales and that the Ghana Armed Forces reserved the right to accept or reject any or all the bids. Based on the this public tender, a reputed European company called Pink Aviation which specializes in sky diving arrived in Ghana and submitted a bid after inspecting the scraps at the two Air Force stations. Led by its Chief Executive, Thomas Lewetz, Pink Aviation put in a bid and offered to buy all the four scrap Skyvans for $42,000. The bid offer from Pinks Aviation was also subject to the following conditions: “Aircrafts may stay in Takoradi Hanger 4 until latest December 31, 2004, GAF is providing space to work on the aircraft in Hanger 4, and we may use existing infrastructure such as light, electric power, compressed air, water etc as available. That we are allowed to perform maintenance action on aircraft during the year 2004 in Hanger 4 using our manpower, tools and spares. We expect a total of about four months work within the whole 2004. Aircraft which are repaired to airworthy status may leave Takoradi for a ferry flight using the Takoradi's runway”. The last condition that Pink Aviation attached to its bid was that the Ghana Armed Forces should provide a written statement saying that the three Aircrafts: Short's Skyvan SC7 with serial numbers SH1930, SH1929 SH1932 had been owned by the Ghana Air Force and that ownership had been transferred legally to Pink Aviation Services and that the aircrafts were not in airworthy condition and that registration of all three had been cancelled in Ghana. GAF by a letter dated 22 December 2003 and addressed to Thomas Lewetz of Pink Aviation and signed by one Colonel G.K. Yeguo on behalf of the Director General of Logistics under the heading “Aircraft Scrap for sale”, accepted the bid offer of $42,000 from Pink Aviation. Col. G.K Yeguo's letter stated that, “I am pleased to inform you that your bid offer of $42,000 for quantity four Skyvan aircraft (S/No.SH1928, SH1930 SH1932) including spare parts, engines and propellers has been accepted. “You are by this letter required to pay the amount of $42,000 into the following account- Bank Address: Ghana Commercial Bank, Tower House, Circle, Accra Ghana, Name of Account: Ghana Armed Forces Foreign Account, Account Number: (withheld by The Chronicle). You are further requested to inform the under mentioned when the transfer is effected” the letter instructed. On 9 January 2004, Pink Aviation accordingly paid the said amount into GAF's accounts and the money was credited to the latter's account. GAF acknowledged receipt of the money. On 4 February 2004, GAF in another letter signed by one Commodore ARS Nuno under the heading “Aircraft Scrap For Sale”, transferred the ownership of the 4 Skyvans to Pink Aviation which allowed Pink Aviation to register the said aircrafts in their name in Europe. Based on these developments, Pink Aviation flew their engineers from Europe to come and work on the aircraft, which had been grounded since 1999. According to them, they invested an additional amount of $80,000 directly into the aircraft in Takoradi and purchased parts such as propellers and engines worth $750,000. After months of work the European Engineers managed to bring the aircraft which was labeled as scrap by the Armed Forces, to a point where they could do what they called “ferry flight” to Tunisia and then finally to Europe where they expected to undertake major repair works to reach airworthiness status. According to legal sources, Pink Aviation has based on the sale entered into skydiving contracts for this summer and has also booked space in London for further repair works to be done on the aircraft. On 15 February 2004 however, when Pink Aviation were set for the ferry flight, they received a shocking letter from the GAF now saying, “We regret to inform you that the sale of the four scrapped military Skyvans aircrafts to you has been cancelled due to national interest and sovereignty. You are by this letter requested to communicate to the undersigned your bank account details to enable us to refund to you the $42,200 that you paid for the four scrapped Skyvans. You will be duly informed when the issue of the sale of the scrap aircraft comes up.” Subsequently, Pink Aviation was prevented at gunpoint from gaining access to the Skyvan aircraft. 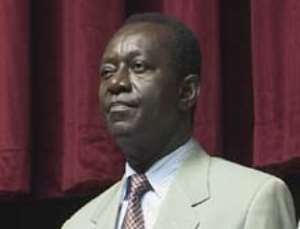 Speaking in an interview with The Chronicle last week, the Minister of Defence, Dr Addo Kufuor said he only got to know of the deal at a certain stage and that as a Minister, he thought he should have been fully informed about the transaction. According to the Minister, concerns had been raised that the aircraft had been sold cheaper than they should have been, so he had ordered an investigation into the matter. In a separate interview with the Airforce Commander AVM EA Mantey, he said the Skyvans were bought about 32 years ago until they were grounded by the Air Force some years back because of “uneconomical maintainable cost” and also the fact that they had become old and were breaking down frequently. He added that spare parts for the Skyvans were hard to come by due to budgetary constraints. The Chronicle has learnt that Shorts, manufactures of spare parts for Skyvans are no longer in operation. AVM Mantey said the Ghana Airforce declared the four aircraft “unserviceable” so a board of survey was convened in September 2002 to start the process for boarding the aircraft. Based on the recommendations of the Board, the Ghana Armed Forces advertised internationally for the sale of the aircraft in December 2003 by auction in-situ. According to the Air Force commander, Pink Aviation won the bid at an auction price of $42,000 but it was later realized that the valuation carried out by the General Headquarters of the Armed Forces Logistics Unit was not properly done because the auction price did not include the cost of the spares available. But all the GAF documents regarding the sale of the aircrafts indicated the scraps were being sold with spare parts and unserviceable engines. The Air Force Commander said in that circumstance, the scraps were revalued at $240,000, adding that the boarded aircraft were to be consigned out of the country as scrap and not refurbished aircraft to be flown out of the country. Following this development, Wing Commander Mantey said the winner of the bid was called for renegotiations of the contract price. Meanwhile Pink Aviation has refused the renegotiation offer from GAF, saying that after 18 years of being in the aviation industry, they were honestly convinced that the price they offered for the scrap was very reasonable and that if the Ghana Armed Forces could sell the aircraft to anybody at the price they were quoting, then they had got an idiot. GAF has since prevented Pink Aviation from gaining access to the aircraft, but the fact remains that the aircraft has been legally sold to Pink Aviation and registration of the aircrafts are currently in the name of Pink Aviation. The company is also claiming that they had invested a considerable amount of money and man-hours to bring the aircraft up to the current stage. After weeks of unsuccessful attempts to have access to the aircraft, Pink Aviation left the country late last month.